After spending time in jail on grand theft charges, a Florida man found himself again in lockup only 15 minutes after being released. The 37-year-old man was seen “acting suspicious and checking vehicle doors” in the parking lot of the jail facility. An officer confronted him and retrieved an iPhone 7, four packs of cigarettes, a lighter, a debit card, a Florida driver’s license and $547 in cash before charging him with burglary, grand larceny, and possession of stolen property. Then the officer brought the man back inside the jail, where he was released a second time — this time with the deputies making sure a person was there to pick him up. Small children and their parents thought they were going to a British movie theater to see the kids’ film Peppa Pig: Festival of Fun (Rated G). 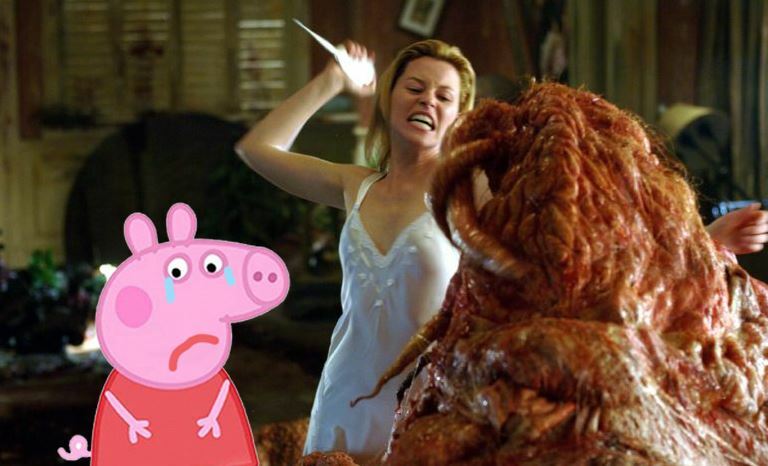 Peppa stars in the popular British show aimed at preschoolers where she and her family snort when they talk. But moviegoers at Empire Cinema in Ipswich got an unpleasant surprise when the trailers began. Two horror movie trailers were shown — one for psychological thriller Ma and the other for scary superhero film Brightburn — which featured dead bodies, sexual violence, a man getting hit by a car, and a child with a scary mask. After many kids in the theater burst into tears, staff was made aware, and the trailers were removed from future screenings. The Bizarro Briefs have reported many interesting techniques shoplifters have used to steal items, but this might be the first time we can report that someone tried to steal a chainsaw by stuffing it down their paints. A man was observed on surveillance footage doing just that in a California equipment store before heading out the door. The most amazing part of this story — it seems to have worked! No arrests have been made and, to our knowledge, no injuries reported. The entire rural town of Story, Indiana is for sale. How is an entire town for sale, you might ask. Well, we must start with the town’s history. The town was founded in 1851 when a doctor named George P. Story received 173 acres of land from then- U.S. President Millard Fillmore. The town was originally known as “Storyville” and by 1882, Story had a dry goods store and post office. But in the 1930s, the Great Depression hit and Story became a ghost town. The more or less abandoned town saw a minor resurgence in the 1980s. A man who just goes by Benjamin bought the four and a half-acre parcel of land with six old dilapidated buildings on it for $65,000. The town was then sold in 1999 to current owner Rick Hofstetter. Now, the backwater town is a tourist destination. How much is the asking price today? $3.8 million. A few weeks ago, we came across the story of New Zealanders being rightfully upset at furniture giant IKEA for selling a world map that excludes their country. Now New Zealand’s Stuff reports that IKEA is working to help that country’s residents fall asleep — by releasing its podcast of staffers simply reading the IKEA catalog. The 30-minute podcast is being introduced just after New Zealand’s switch to Daylight Savings Time, which happened Sunday. IKEA’s New Zealand market leader told Stuff that the podcast is a “unique take on creating background white noise and one of many solutions we hope to provide to help the many Kiwis get a good night’s sleep.” And of course … plant subliminal messages inside their heads to shop at the company’s new Aukland store. It will cost more than $50,000 to repair a Connecticut baseball diamond after a group of people thought it would be a smart idea to dry out the infield by pouring gasoline on it and lighting it on fire. Police are investigating the fire in Ridgefield, where 25 gallons of gasoline was poured on the field recently and set alight. The first selectman of the town told Hearst Connecticut Media that 75 to 100 people watched this incident of sheer stupidity unfold, with some recording it on their cell phones. Now, a hazardous waste removal crew is digging up the contaminated soil. Great job, everyone! A hunter who entered a wildlife preserve in South Africa to illegally poach rhinos met with a nasty end when he was trampled by an elephant and then devoured by a pride of lions. All that was found of the man was a skull and a pair of pants. The manager of the preserve, Kruger National Park, released a statement that entering the preserve illegally and on foot is “not wise,” and urged others to rethink doing so, lamenting that so little of his remains could be recovered by his grieving family. A toddler’s got to do what a toddler’s got to do. Unless, of course, that means four toddlers escaping a day care center to wander alone along a highway. That’s just what happened in Louisiana and now the day care center has had its license revoked. The Louisiana Department of Education revoked the license of Color Wheel Learning Center in Prairieville, Louisiana after the one-year-olds escaped their play yard and ended up outside of a fence by a highway. The day care center had no explanation for the October 2018 incident after a passerby stopped when he noticed the children and returned them to Color Wheel. Luckily, none of the children was harmed. Two scuba diving enthusiasts got married recently … underwater. The underwater wedding ceremony took place in Australia and was captured on video by a wedding crasher. A woman was walking her dog at Blairgowrie Pier in Victoria, Australia, when she spotted the wedding party preparing to take a dive under the waves. The woman, who just happened to be a marine biologist, went home to grab her scuba gear and returned to film a segment of underwater nuptials.